I remember playing King’s Quest ages ago. I don’t remember exactly which game it was — though the timing matches up with King’s Quest VII: The Princeless Bride — but I vividly recall sitting down at a friend’s mom’s computer and being enthralled in this classic adventure game series. I was content to sit and click around the screen, picking up items and solving puzzles to advance the narrative. Since the mid-90’s, this style of classic point-and-click adventure game was largely lost to me. I became more of a console gamer, and these slower paced games didn’t have a home on living room platforms. Recently, we’ve seen a revitalization of the adventure genre, thanks to developers like Telltale Games using strong licenses, and Double Fine bringing back classic LucasArts favorites. None, however, have struck me as true to the genre as what The Odd Gentlemen were able to lovingly craft when they made this revival of the exemplary franchise that was the catalyst for our modern narrative in games. Move over Telltale. You’ve got some significant competition in the adventure gaming field. Releasing in the same fashion as episodic Telltale games, King’s Quest’s chapters are quite a bit meatier than your standard individual episode — at least this first one is — with a five hour average run time. What’s even more impressive is the replayability, as alternate ways of solving the game’s puzzles present themselves over the course of the story. I decided to use the shield as the wheel for the merchant’s cart, but I could have also used a wooden table top or a massive circular loaf of bread. How does that simple choice affect the story and future interactions with the characters involved? How will it affect future chapters? 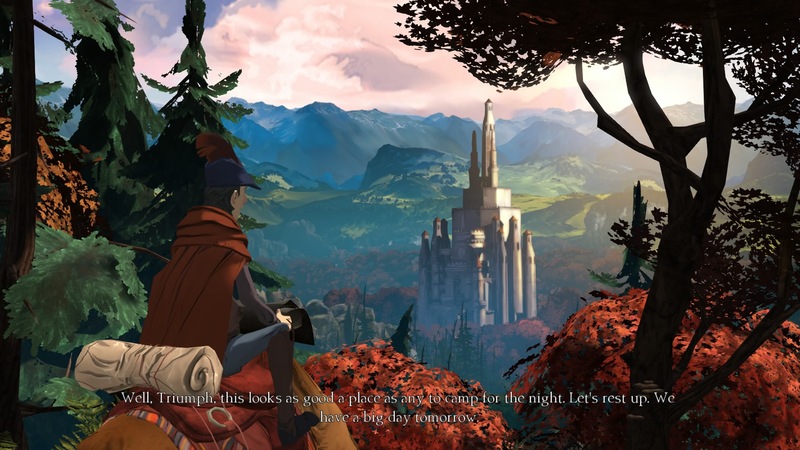 King’s Quest is the story of King Graham recounting his tales of adventuring, becoming a knight, and — I assume later on in the series — eventually king, to his granddaughter Gwendolyn. The elder Graham is voiced by Christopher Lloyd and his voice acting shines brightly as he delivers a barrage of quips and puns that are characteristic of the series. The voice acting is as colorful and vibrant as the visuals and there are some strong names in the cast, in addition to the aforementioned Christopher Lloyd. Wallace Shawn — of “inconceivable” Princess Bride fame — gets some time to shine, with a particular segment that will make fans of his role on Princess Bride grin. Tom Kenny, the voice of that aggravating talking yellow sponge in the square pants, plays a particularly pushy merchant who may or may not relieve your coin purse of some weight through less than scrupulous means. The story is fun and lighthearted with witty dialogue that kept a smile on my face, but isn’t without its own depth and emotion at certain points. It reminds me of a Disney classic, with elements that anyone can find enjoyment in. As Graham, you will be tasked with adventuring around the city of Daventry, talking to people and collecting items to solve puzzles and advance, much like the classic point-and-click adventure. Unlike Telltale games that tend to focus on a linear and moving narrative, and choice within that storytelling, King’s Quest is much more puzzle focused, with solutions to puzzles opening new areas with new challenges, and new options in old areas. The puzzles can be solved in a variety of ways and really open up the game to replayability, especially if you listen to the hints within the dialogue about how certain challenges can be overcome. I never felt a sense of weird “video game logic” about the puzzles and the solutions always fit naturally with the narrative and the world. There were no moments where I was asking myself how I was supposed to figure something out and everything felt intuitive without the use of any kind of guides or hint structure. One thing that got a bit aggravating was the bit of backtracking that needs to be done when I was testing out solutions. While this is an adventure game, and that’s part of the genre, even a run button to allow Graham to get around a little faster would have been appreciated as I found myself plodding up and down the same forest path. It wasn’t excessive, and you can tell The Odd Gentlemen tried to design it in a way that didn’t feel too repetitive, but the nature of the beast still rears its ugly head. It may just be something we have to deal with in the genre. I Have to Listen to This Again? I would have also like to have been able to skip dialogue. Not the first time around, because the amazing voice acting is well worth listening to, but as I am looking for a solution and talking to the citizens of Daventry, I don’t want to have to listen to the same lines of banter over and over again. Perhaps a line of code to recognize if I’ve heard that line before or not and then giving me the option to skip it? The voice acting is great, and I never actively wanted to skip anything unless it was the second, third, or even fourth time hearing the same lines. The vibrant, hand painted visuals are gorgeous, and help the fun, lighthearted script really pop off the screen. The Odd Gentlemen took each model, unwrapped the texture, printed them out, and painstakingly hand painted each of them. 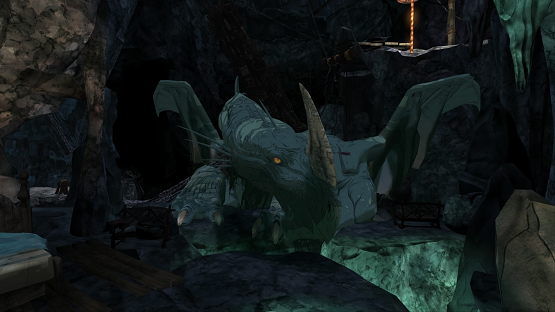 They then scanned them back in, and re-wrapped the models, so everything you see in the game was painted by hand. This visual styling really helps that classic Disney feel that I mentioned before, and aside from some minor clipping issues here and there — most notably on the blacksmith’s hair — I never noticed any major problems graphically. 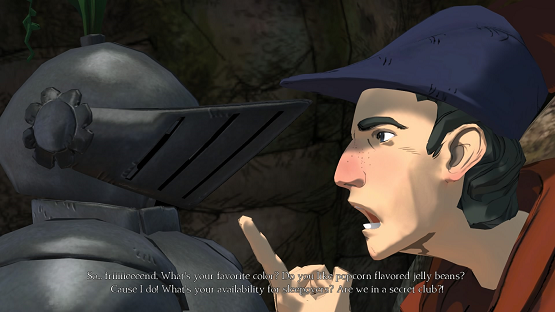 King’s Quest Chapter 1: A Knight to Remember is brilliant. The Odd Gentlemen have managed to modernize a classic, retaining much of what makes the originals so beloved, yet not making it feel outdated for modern gamers, even if we do have to deal with a bit of backtracking. I’m crossing my fingers that the episodic release doesn’t mean we’ll have to go for more than a couple of months without a new chapter, because I’m eager for Graham to continue telling me the tales of his king’s quest. While we wait, however, A Knight to Remember is well worth a replay or two to pass the time. King’s Quest Chapter 1: A Knight to Remember review copy purchased by reviewer. For more information on scoring please see our Review Policy here.